Don't ask me why but I love looking at the inside of animatronics as much as I enjoy looking at the outside. I'm a fan of Country Bear Jamboree and it's Marc Davis style. More than anything I like watching a room full of entertaining animatronics do their thing. The photo? This photo of the broken down "Max" head was taken a few years back in none other than Magic Kingdom's Haunted Mansion itself. It was collecting dust under the elevated Doom Buggy track in the Séance (Madame Leota) Room. Before declaring it completely "abandoned", I must make an educated guess that it is/was used for parts. Duplicate animatronics exist for many, but not all, figures in the parks so one can be fixed while the other stays in the attraction. Could this have come from Disneyland? Don't know. I'd love to know how much was sent to Florida in the weeks that followed that sad day in 2001 when the Playhouse closed to make way for Pooh. · Disneyland had two identical theaters to handle high capacity. One long lobby with two theater entrances. Ever notice? I was in there one night back in the 90's and went in the wrong door, noticing a mirrored image of the theater I had just seen. Remember the cool coin-operated machines in that lobby? Foot massagers and stuff. · Magic Kingdom was the first to get Country Bear Jamboree, not Disneyland. 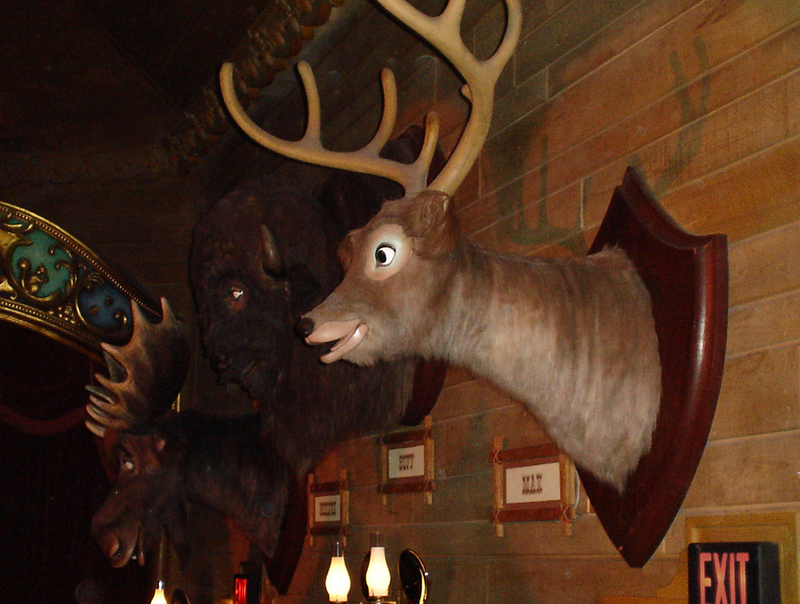 · California Adventure's Grizzly Peak area will never get a rebuilt version of Country Bear Jamboree (like rumors have said) because cool things like that never get built anymore, especially in DCA. · Marc Davis hated the idea of Christmas and summer versions of Country Bear. (Confirmed by his wife, Alice Davis when I asked her about things that ticked off the late genius. She said, "he never understood why they didn't just leave these things alone. They just make them worse when they mess with them". Well said, Alice. What is an Audio Animatroic you say? (or "Animaltronic" as some erringly say). Let Eric Boardman (who? ), Marty Sklar, Wally Boag, and others take you on a 1980's tour of Disney's lovable robotic story-telling figures. Enjoy cool behind the scenes looks at The American Adventure "walking" Ben Franklin animatronic, some Country Bears, Pirates, small world kids, and of course Tiki Birds. How can you not love Audio Animatronics? ?